A peck of peaches is becoming my new summer tradition. Lured in by cute roadside farms or beauties at a berry farm, I enthusiastically pick the prettiest peck to bring home. A peck is between 12 and 20 pounds. I didn't know that last summer, but somehow that fact slipped my mind as I payed for and carried home another twenty this year. 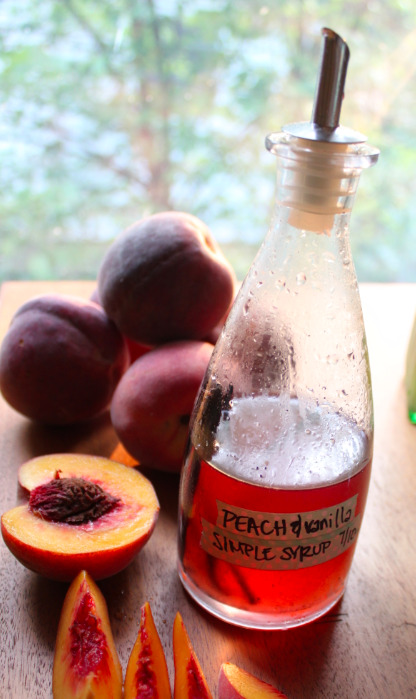 Last year I made two kinds of peach jam and preserved peach slices in their own syrup. I flavored some bourbon and ate some peaches. This year though I didn't mess with jam or bourbon, I went straight for canning those peaches in their own syrup. They were quite the commodity in my canning cupboard last year and I was sad to use up the last jar. I had baked the peaches into pie, and quick breads and served them straight up over ice cream all year long. But the syrup was my favorite part; over pancakes, in cocktails and sodas, as a glaze on pork. It held all the flavor of the peaches, without their bulk. Partly inspired by this New York Time Article (its about chefs making use of scrap, if you don't want to click through), I decided to make some extra syrup from the peach skin. It was easy and the results were pretty and tasty. 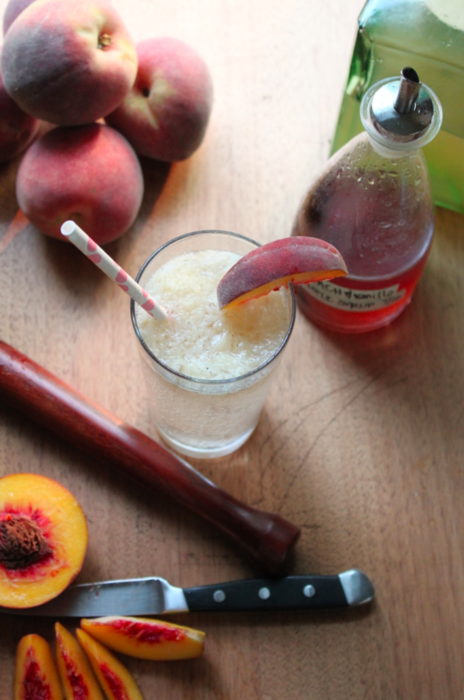 It doesn't hurt that it also makes a delightful peaches and cream flavored drink, prefect for sipping on your patio on a long hot summer afternoon. Combine the peach skins and water in a large saucepan over medium heat, don't worry if the water doesn't completely cover the skins. Bring to simmer and cook for 10 minutes. Remove from the heat, cover and steep 1 hour. Strain and reserve the liquid from the peach skins. Discard the skins and return the liquid to the saucepan. Add the vanilla bean and sugar. Bring to a simmer over medium heat and cook until all of the sugar is dissolved. Remove from the heat and cool for at least 1 hour, if your fancy, funnel into a bottle and top with a bar pour. This syrup will keep in the fridge for about a month. Combine the peaches with the syrup in a collins glass. Use a muddler (or wooden spoon) to break up the peaches. Add some ice, followed by the vodka and soda water. Stir gently to combine. p.s. Here's another little diddy for the NYT about South Carolina vs. Georgia Peaches, personally, I've had really delicious and really so-so ones from both. What do you think?